The Triumph of St. Thomas Aquinas. Thomas Scarborough unravels links between metaphysics and theology in the writings of Fr. Cornelis (Kees) Thönissen. About the size of a modern A4 sheet of paper, a painting of Benozzo Gozzoli (1471) hangs in the Louvre in Paris. 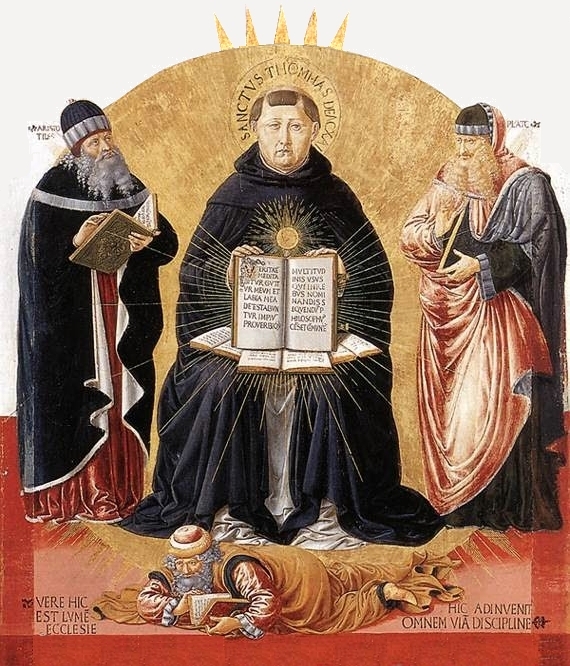 Titled The Triumph of St. Thomas Aquinas, it depicts St. Thomas, seated with a completed metaphysic on his lap, flanked by Aristotle on the left, and Plato on the right. At his feet lies the Arabic philosopher Averroes. 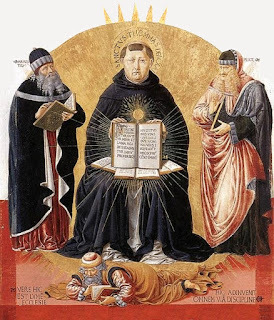 It happened chiefly through the influence of St. Thomas Aquinas: through Aquinas' writing, the thought of the Roman Catholic Church was tainted by barren metaphysics – which further opened the door, in time, to Enlightenment rationalism and scientific-technological reason. Such reason is linear, mathematical, geometric, and finally, analytic. It is epitomised by Newtonian logic, which works on universal laws. This means that everything rests on experiment, and thus the (observing) senses. Such rationality, while it is rightly a part of the universal structure of what we are and who we are, has limitations of narrowness. Reason in its fulness, wrote Pope Benedict XVI, is far larger than that. It is the all-meaning logos, which is the reason of the mind of God. This includes the reason which asks: What is the meaning of all things? Why do things ‘hold together’ in the way that they do? Why are we here? To what personal purpose, and what end? 2. By taking into account our human relationality. THE FIRST APPROACH: Is our reason really capable, through the mind alone, of finding the ‘big’ answers tolife? The Roman Catholic Church has traditionally held: Yes. Yet what kind of ‘reason’ might this be? It cannot be the same as the narrow reason we have just described. Or does the Church's ‘reason’ really include insight as intuition – into and behind reality? Such a human capacity would lie beyond linear reason – beyond physics – a capacity which was partly perceived by Aristotle in his Meta-physics. What then should we call this capacity or faculty ‘beyond reason’ – this something that we naturally, innately possess – this capacity which is somehow tied back to the ‘Being’ behind the universe: the religious spirit, the Jewish heart, the Greek pneuma, the breath of life, and the Christian soul? Aha, now we have passed further than the ‘mind alone,’ so that we need to rethink how we are constituted by our anthropological capacities, which are more than just a brain and a body. The Roman Catholic tradition, when it speaks of reason, has failed to adequately distinguish reason in its fulness, as logos, from narrow Enlightenment reason or scientific-technological reason. Yet ‘reason’ clearly includes the insightful, spiritual capacities, or spiritual intuition. And there’s the debate set out for us! If we are content with rationalism coupled to our brains, we fool ourselves into shallowness. And such shallowness, as postmodernism has pointed out, cannot save us, or our planet. What, then, is ‘the more’ of me and you about? THE SECOND APPROACH: Most of all, each of us is heavily involved in relationships – or relationality. We find that what is most precious to us is our relations, which is the foci (persons!) that consume our energies. Aristotle and St. Thomas were more involved in things. So was Kant. Thus the category of relation was downgraded. So why has the Church pressed so heavily for thinking ourselves towards God (although this is valuable as far as it goes)? We can think about relationships, but we do not think them. Those who are ‘in love’ don’t start there. They start with the experience of self-giving. The Judaeo-Christian religion begins with the Revelation of God, set in human history – above all through the Son of God on earth. A fresh, ‘humble’ metaphysics begins, not so much with God in himself as we think about him, but with God who is in relationship with me. It reverses the Church's traditional path. Through reason in its fulness, as logos, we may know God directly. This even a child can do. We’ve only made it hard because we double-think everything. Relationality holds everything together in meaning. Therefore relationality has to be an essential category of our existence. Relations, then, occur in our experience – which makes experience an essential category, too. And we need to be able to intuit these relations, which requires a spiritual intuition or capacity beyond the brute force of narrow reason. Spiritual intuition, therefore, is as basic to our existence as scientific-technological reason. A seven-hundred page dissertation by Fr. Dr. Cornelis (Kees) Thönissen OFM Cap. may be accessed (free) at: Thönissen C.J. 2015. Foundations for Spirituality: A 'Hermeneutic of Reform' for a Church Facing Crises Inspired by St. Francis of Assisi. Pretoria: UNISA. Is your essay a question about how we became accustomed to reality? And then the search within that reality that is ever changeable for eventually (maybe) relations is all we have? And whether that relation is towards a God, or a thing, (for I think between us and things we can talk about relation as well, meaning: the relation between things is named and not the thing itself) we have the ability to intuit self giving that in reason forgot to, as I recall Heidegger mentioned: to place oneself over oneself ? Did, in your opinion, the church then preach immediate life experience on the contrary of placing it in a philosophical dimension? Like technology tends to do as well? Maybe I’m completely on the wrong track, your article is difficult for me because it involves the church and I don’t know where to place that idea; to be honest I do have prejudice about that, which makes your article difficult for me. It’s an issue of definition – we distinguish speculation-based metaphysical reason and experiment-based scientific reason. In Aristotle’s metaphysics they were mixed, while analytical philosophy has distinguished them through operationalism and meaning theory. I agree that speculation could be meaningful, such as the imagination of God and the relevant concepts, without which it wouldn’t be possible to turn a race of jungle animal into a social being. Dear Chengde and Tessa, Thomas is in deepest South Africa just now but will write soon as he gets that solar panel rigged up, I'm sure! For myself, I am struck by the non-existence of that distinction - speculative and experimental philosophy. Because science is really speculative and experiments -at best - are used to back up these intuions. Quantum science does not even pretend to be experimental.What Tessa describes reminds me of Plato though, possibly Heidegger's mentor, Husserl, who writes:"Experience by itself is not science." I have dropped a short video on PI's Resources > Noticeboard of where I was in my absence. And yes, I lit up that house with one of my own designs -- in perfect nick when I checked it recently. Being an insider in the Church, I think that the Church is capable of both greater good and greater evil than is typical of the world. There are a few reasons for that, which perhaps I could go into sometime. What struck me about Father Kees' essay (rather, my essay on Father Kees) is the fundamental difference between this and (traditional) Protestantism. According to Kees, we have an innate ability to find God, while Protestantism teaches that this is impossible. Someone put it like this: there is only redemption, no remedy. I recently refreshed my familiarity with Kamlah and Lorenzen's Logical Propaedeutic. They have a chapter in which they briefly contrast scientific thinking with its 'heavy price'. There is something awful we have done, they say, through our scientific thinking. I would think that Father Kees seeks to reconcile our different modes of thinking, scientific and non-scientific. In so doing, he criticises his Church for having been so cerebral in its thinking about God as to have lost the heart of it. Now back in range of the Internet, I have informed Father Kees that "his" essay is up. Perhaps he will comment himself ... ?